New Mexico enjoys—or sometimes suffers from—a number of artworld stereotypes and iconic images. This is a good thing, as it draws many people to this very special, out-of-the way place. But images of western landscapes and traditional Native American pottery looms so large in popular consciousness, that the whole other-world of contemporary artists working in Santa Fe, and the Southwest in general, can be overshadowed or obscured completely. This is not at all to diminish the value of these more traditional arts, but only to say that Santa Fe, as is generally true of communities in the West that are less well-tread, has historically been an incubator for a wide variety of artists, and continues to inspire and foster experimentation. The exhibition that came out of these initial questions seeks to draw awareness to the ways that women artists have found ways to make a show work irrespective of institutional or popular support, and the uniquely feminine perspective or female voice that characterizes that work. Looking Forward, Looking Back looks back to address the lineage of women artists in the Museum collection by exhibiting works by Eleanor Antin, Judith Francisca Baca, Louise Bourgeois, Eva Hesse, Nancy Wilson Kitchel, Sheila Levrant de Bretteville, Ana Mendieta, Faith Ringgold, Jaune Quick-to-See Smith, Pat Steir, May Stevens, and Beatrice Wood, and looks forward through its presentation of installations by three contemporary artists: Ligia Bouton, Angela Ellsworth, Micol Hebron. While some of the works in the show do express Feminist perspectives and interests, according to Scully, "This exhibition is about this idea of female voice and how each of these older works by women that has a female perspective has informed these contemporary projects. I think everything in the show has a female perspective, whether it’s a Feminist perspective or not.” In the work of Bouton, Ellsworth, and Hebron, issues around power, visibility, identity, and agency are explored across three bodies of work that engage or have created their own unique iconographies. Ligia Bouton draws on narrative and allegory in Understudy for Animal Farm (2012 - 2014). 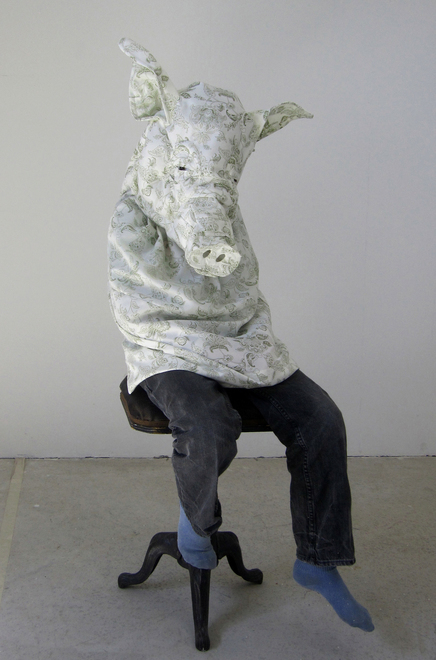 Inspired by George Orwell's novel which used allegory to criticize the Russian Revolution of 1917 and Stalinism, Bouton appropriates this allegory and reverses it, asking viewers to pose as “understudies” for the pigs who pose as humans in the satire. At first glance, the installation looks like a whimsical storybook setting. A pastoral farmland serves as a backdrop to twenty-six pig face masks, hand-sewn out of patterned pillowcases and displayed alongside a hand-painted wooden cart and mirror. During certain artist-orchestrated events, viewers are asked to select a mask and wear it to have their portrait taken. Finally, the participants are given a code to view and release their photographs onto the project’s website, though once the image is up, it is no longer private. I think the pillowcase itself is a very strong image. In addition to tying the political to the domestic in this context, it has also been used—particularly in American history—to think about and to illustrate power. I think about Abu Ghraib, and I think about the Ku Klux Klan and the homemade nature of some of those garments, and I don’t think it could ever have been an innocent action on my part to put a pillowcase on anybody’s head in a public space. 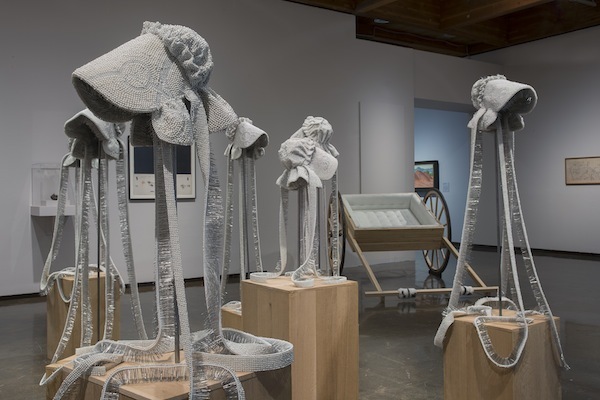 The installation layers the languages of Animal Farm, bedsheets, and historical narrative to address concepts of power on both political and personal levels, as well as the loss of identity and agency through the motif of the mask. Micol Hebron’s Gallery Tally (2013-ongoing) project makes use of social media and appropriates the communicative efficiency of posters to make visible the gender biases of art world representation of women artists—whether in commercial galleries, museums, advertisements, or auction results. 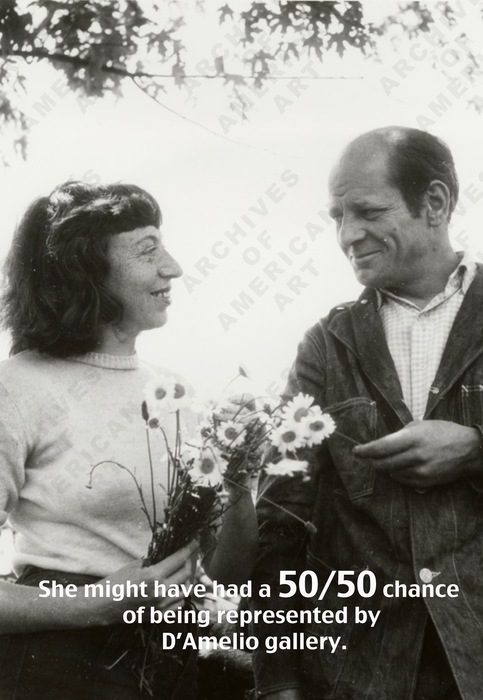 The artist began the project by first tallying men and women artists with full page ads in Artforum in the fall of 2013. Then, drawing on the lineage of the Guerilla Girl’s 1986 Report Card, Hebron began crowdsourcing posters by putting a call out via social media for artists to take their own tallies of commercial galleries and design posters around their findings. The resulting posters can be seen on the Gallery Tally tumblr. Crowdsourcing and poster art especially serve the project, making it fundamentally inclusive, tapping into the visual language of advertising and design—as is seen in Siobhan Hebron’s appropriation of a 1950s advertising aesthetic in 2014 Whitney Houston Biennial. While a lot of talk and frequently shifting numbers and percentages get thrown around regarding representational imbalances in the art world, these posters take these abstracted or out-of-sight biases and make them concrete. Created on an ongoing basis by artists living in various places, the posters also represent a growing consciousness around this issue and a demand for increased awareness. Moreover, as more of these posters accumulate, they make the broader statistical trends undeniably clear: the average finding at this time is about 70% male to 30% female representation in galleries. The Gallery Tally project brings the viewer full circle in thinking about the collection practices of museums: institutional support is certainly a vital factor in maintaining the legacy and visibility of female artists, yet it does not effect them building their own iconographies independently. 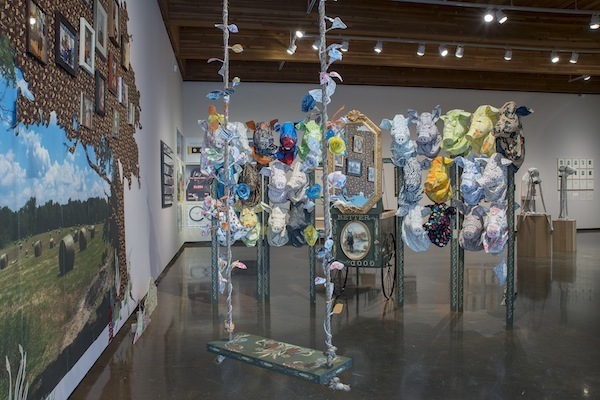 While the exhibition is comprised of 100% women, a poster by artist Annette Abundantia recently uploaded to the Gallery Tally project blog indicates that the New Mexico Museum of Art collected 221 works from 2010 to 2015, 67 of which were female. That’s just 30%. Ultimately, as seen in several of the older pieces in the collection—such as Eleanor Antin’s Fluxus-inspired mail art, 100 Boots Marching (1971-73)—and more recently with the use of social media and crowdsourcing, artists have and continue to push this dialogue around representation and power from outside of institutional outlets. The three bodies of contemporary work in Looking Forward Looking Back explore widely varying themes and engage distinct methodologies, however each addresses at their core issues of visibility, agency and iconography across our current political, domestic and commercial spheres.